I flew from Heathrow Airport via Detroit. When I arrived in Anchorage, Alaska, I found out that one of my pieces of luggage was left in Detroit! The one with most of my climbing gear in! Anyway, I got it back, late the night before we left on the 7 hour drive to the small town of Talkeetna from where we flew through the mountains onto the glacier where we would spend our first night. We set up camp and sorted out all our gear again for an early start the next morning. A typical day was a 7-10 hour day, carrying a 20-30 kg backpack and pulling a 20-30kg sled. This was a proper expedition of 12 climbers where we carried everything we needed for the 4 weeks – personal gear, clothing, tents, kitchen tent, cooking utensils, stove, toilet can, food. The strategy was to carry as much as we could to base camp and then ditch the sleds and only the most necessary items above that. As we slowly worked our way up the mountain, we ferried gear and food from camp to camp, sometimes caching it half way – ie digging massive holes in the snow, throwing our stuff in, filling it up and placing markers all around the area so we could identify the cache even if there was a whiteout. We’d then climb back down to the last camp, stay the night and next morning move all the way up to the next camp, stay the night and the next morning, climb down to pick up the cache and take it to our new camp. We’d then rest and acclimatise before going through the same process to get the next camp! The first week of the climb involved us working our way up the glacier, through gaping crevasses, over snow bridges. We were all masters in rigging ourselves to each other with climbing rope and rigging our backpacks in such a way that if one of us were to fall into a crevasse (which did happen but luckily no one got injured) we would be able to undo our backpacks but they would still be attached to the rope. This was important, as otherwise, with so much rope and gear strapped onto us, it would have been very tricky to get the pack off whilst dangling in a crevasse given they were so heavy. Week three involved moving from base camp to the advanced base camp (ABC) from where we would make our summit attempt. This was the trickiest section of the climb. It was very steep, rocky in parts and we had to navigate all of this with heavy backpacks. The first obstacle was a sheer 500m snow/ice face which we had to climb up using jumar clamps. Many less experienced climbers gave up here due to the brute force required to haul yourself up and the stamina you needed to be able to get through the four hours it took. There was also the added effect of altitude as this was very strenuous work given the little oxygen there was in the air here. At the top of the headwall, after a well deserved rest and picking up our cache, we navigated through rock, snow and ice to the top of the ridge that would lead us to ABC. Navigating boulders on a ridge with sheer drops on either side was quite technical and quite scary! Before arriving at ABC we noticed behind us a storm coming in. Luckily we got to ABC and we were able to set up our tents and build snow walls (we carried ice saws with which we sawed big bricks of snow and ice to build snow walls) to protect our tents from the winds we were going to get hammered by. ABC is a notoriously harsh place to stay due to the changeable weather and ferocious winds that can rip tents from their anchors and blow them over the ridge back to base camp 1km below! The storm blew over after a few days during which we were able to rest and prepare ourselves for the summit day. We kept in contact with base camp and the night before, we got the message that the next morning might give us a window in the weather to go for the summit. It did. 4am start. The sun tucked away behind the mountain and it was bitterly cold. Everyone silently prepared themselves. We all crunched along in our crampons on the freezing snow that had fallen the day before, along the edge where a woman had died just a few days earlier. 7th July was a long day. It took 8-9 hours to get to the summit. The summit ridge seemed never ending, as well as slightly precarious! But we were lucky with the weather, apparently we were blessed with weather rarely seen by Denali summiteers. The summit photos say it all. Hard to believe we were subjected to Denali’s freezing storms only a few days ago. Success was not guaranteed yet – we still had to make it down safely. We did and marching back to the airstrip three days later (essentially a patch of ice and snow) through the middle of the night, with the sun only dipping slightly behind the mountains at night and never setting, victorious was a pleasant feeling indeed! I’d just like to mention a big thanks to our main guide, Heidi. Sadly, Heidi who was a great leader, died recently doing what she loved when she got caught in an avalanche whilst skiing on one of her holiday breaks from guiding on the mountain. Kosciusko was the easiest of them all. At only 2,228m it was never really going to be too taxing. It was a 6-hour round trip from Thredbo ski resort. Cheryl (my new wife) came with me and we shared a picnic near the top. I arrived at Mendoza at around midday about three days later than scheduled due to passport issues... (a long story). This meant that I missed out on some acclimatisation time. We moved from Lower Base Camp at Confluencia, 3200m, to Base Camp at Plaza de Mulas, 4200m, two days after I arrived. The trek to Base Camp was a gruelling 8-hour slog through the never-ending valleys, dust and rock. Because there was so much dust being blown into our faces, we had to make sure every bit of our faces was covered up. I was feeling the altitude and had a splitting headache half way along. The others seemed fine and this was a worrying trend for me over the next week and a half. My lack of acclimatisation compared to the other three was very noticeable. We spent seven days at Base Camp, doing training climbs and carrying up our loads to the next camp at 5,000m. During one of the training climbs Daniel, one of the team members, developed some sort of heart issue and had to be airlifted off the mountain! At each camp the views were amazing and they got better as we went higher. Certain mountains which looked enormous at the Base Camp now stood way below us in the distance, showing just how massive Aconcagua was. It is so difficult to comprehend the size of the mountain from photos or from an aeroplane – when you are on the mountain you really do feel insignificant and at the mountain’s mercy. And we were. At night, the wind would whoosh down the mountain. You could hear it approaching from quite a distance as it worked its way though the rocks and grooves in the mountainside, until it reached the camps when it turned into an horrendous howl. The tents were well secured with heavy rocks but it still felt like the wind would either carry us away or tear the tent apart. It was freezing. But Aconcagua was relatively generous to us. We had to go up in temperatures of minus 41 degrees centigrade, but only a few days prior to our summit attempt it was minus 54 towards the top. Before Aconcagua, I never really realised just how cold those temperatures were. I had been in the cold but not in the extreme cold that we faced up there and when I read in books about those temperatures I thought to myself that it was only the opposite of a change from say a cold winter’s day in the UK to a typical summer day in Mauritius. It couldn’t be much worse moving the other way into negative temperatures, could it? 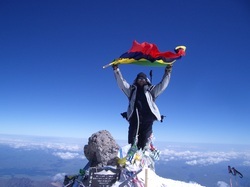 We made our summit attempt on 3 December. After around eight hours of climbing in the bitter cold (down to minus 45 degrees centigrade), extreme wind and thin air we reached the Canaleta, a steep and dangerous slope of about 300 vertical metres that led up the west face of the summit. To get to this point, we had sped up the rocks just above the last camp to keep us warm. It killed our legs and lungs but Ceferino insisted that we had to keep the pace fast otherwise we’d freeze and really slow down. I was slightly worried that we would end up exhausting ourselves but it did work and warmed us up for the rest of the day quite well. And that’s what got me to the top. Sheer determination and will power. Despite the odds,I had made it to the top of South America. I yelled a feeble out-of-breath ‘woo-hoo! !’ as I took pictures of the 360 degree view. The Andes stretched as far as the eye could see. The steep snow covered South Face looked magnificent in the sun below us. Again I thought to myself, what a wonderful world we live in. I had lost five kilograms. My face was peeling off and my nose was sun and wind-burnt and a little frost bitten. But I was overjoyed and I couldn’t believe that I had made it after coming so close to not even getting to South America. Mount Elbrus was a beautiful mountain. It didn’t look menacing at all from the bottom but as we made our way to the top, my views on this changed and Elbrus definitely earned my respect very early on. There was only one mountain hut (above the hotel in a small village at the foot of the mountains, which we stayed at for two nights), this was at around 4,200m. We stayed at the hut for four nights and this included weathering a snowstorm, which was very severe. One of the days we spent at the hut was used as a training day. We climbed up to the top of a long snow slope which must have been at least 50 metres in length. This was to be our training slope for the day. We each took turns to slide down the slope to practise our ice-axe skills. Each time we slid to the bottom we were out of breath from the exertion of having to control ourselves sliding down at altitude with the lack of air. But after reaching the bottom we would have to climb back up to the top with our crampons and ice axes. Once was tiring enough but we must have done this at least 20 times. A couple of times on our backs, gaining speed and flipping onto our bellies to frantically dig our axes into the icy snow slope. We tried several combinations, the most exciting was where we slid (quite fast) on our stomachs, head first, with no ice axe. One of the others would be standing just above the bottom of the slope and we had to lift our heads to focus on the axe whilst we sped downwards, reach, grab the ice axe from them and then dig it to the side to spin us the right way around and then bring ourselves to a stop. Unfortunately, half way back to the hut, as I stepped from snow onto some ice, my foot fell straight through into ice cold water. As though it all happened in slow motion, I could see my foot slowly sink into the water and the water slowly creep up my boot, into my gaiters and in through the top of my boots all the way to the tip, through my socks and to my toes. I could also see my chances of summiting disappear. I screamed, ‘Oh No!!! !’ (or something along those lines!) and tried to lift my leg out before it got wet but it was too late. It all happened in a split second. Now I would never be able to get to the summit with a wet boot as it would be guaranteed to give me frostbite. I felt like I had just wasted a whole week, lots of money and all that preparation. We had an extra day at the hut but the boot was still damp on the day before we were due to summit. On the afternoon before summit day a fierce snowstorm decided it would pay us a visit. That bought me an extra day to dry my boot. It did dry in time and we got a window to make a break for the summit which was successful for most of us. Afterwards we celebrated with plenty of Russian vodka. Some guys didn’t make it though. One had severe altitude sickness and had to be brought down to the hut after only a couple of hours, and another had severe diarrhoea all the way up. 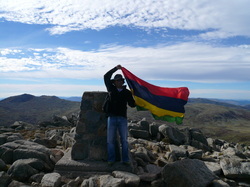 However, when I got back down and looked at the photos, I realised that in most of the summit photos I had been holding the Mauritian flag upside down!!! That’s what the cold and lack of oxygen does to you. I wasn’t, however, going to go back up to take the photos again! So far I had only climbed Kili. 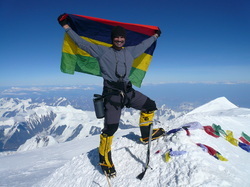 I had decided by now that I had the ability and desire to conquer the seven summits. However, I thought it would be better, rather than to go straight into them, to get some formal training on snow, rock and ice. I found out about the International School of Mountaineering – not only would I be able to get some training but I would also be able to climb the highest mountain in Western Europe as well – Mont Blanc; kill two birds with one stone. The training was rigorous.We climbed Mont Blanc after five days of training via a more technical route than the normal trekking route. This included climbing up one particular 300m snow face. The gradient must have been 70-80 degrees at most points. Climbing up this kind of snow face with two ice axes and crampons is especially tiring, particularly at altitude. Each time you dig the ice axe in, your gloves make contact with the snow so the cold penetrates through to your hands almost all way up. What made this even more spectacular was that we climbed it in the dark. From the bottom the snow face loomed over us glowing blue in the moonlight. On the way back down from the summit we had to down-climb this same snow face. My heart must have skipped a few beats when I leant over the top to get a good look down it. Down-climbing requires a great deal of concentration as you have to make sure that you don’t jab your crampons into the rope and cut it as it dangles from your waist between your legs. The three of us were attached together and I was in the middle. Down-climbing seemed to be going pretty well when, towards the middle of the snow face, all hell broke loose. Everything happened within seconds – somehow the three of us lost grip of the snow face and accelerated down the mountain. We must have slid for some 100m, pretty much vertically. Luckily our training kicked in; as soon as I realised what was happening I started jamming my ice axe into the snow as hard as I could, whilst screaming my heart out. I presume the others must have been doing the same and at some point one or all of us got a good grip of the face and slowed down. We were all in quite a bit of shock, our legs were shaking and we needed to rest so we dug snow holes and sat in them, albeit rather precariously, our crampons holding us in place. No-one said a word until we got to the bottom. We were happy to be back safe and sound. I had first seen Kilimanjaro when I was flying from Mauritius to London. This was at the time that passengers could still visit the cockpit and have a chat with the pilot. I was flying with a friend at the time and so we decided to ask if we could go. As the pilot was explaining some of the controls on the dashboard to us, he pointed though the windscreen and asked us to look outside. So we did and the view through the four big windows was amazing. 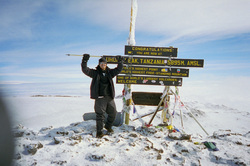 Down below Kilimanjaro stood in all its splendour with its snow-covered top. It was a beautiful sight. I don’t know why but it was at that point that I decided that one day I would try to climb it. Kilimanjaro was an amazing experience. 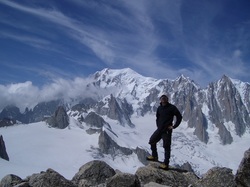 It was my first high altitude mountaineering experience and will most probably be the most memorable. I remember spotting the mountain for the first time, and feeling my heart race when I did see it, during the 8 hour minibus journey to our hotel. Kilimanjaro is the highest freestanding mountain in the world and, from sea level or thereabouts, it towered above the horizon and way above the sparse clouds that surrounded it. I had read about the effects of the altitude but it was a real shock actually feeling it and I did not expect it to be so painful. I had dreadful headaches at 4,200 metres at the last camp. We arrived at the last camp, Kibo Hut, in the late afternoon after 8 hours of trekking and the last 100 vertical metres to the hut were a struggle. We had some soup (at altitude you lose appetite and we did not want to eat anything at the time). We then had a couple of hours rest and left for the summit at midnight in the freezing cold (minus 25 degrees centigrade) and snow. At the top of the crater (Kili is one of the world’s largest volcanoes) everyone was completely exhausted and suffering from the cold, so when the guide asked who wanted to carry on the extra hour and a half to the summit, no-one replied. I thought that I had come all this way and got this far and that no matter how tired and exhausted I was I was going to continue to the summit. So the guide agreed to take me. Then one by one three others agreed to continue and we made it all the way to the summit. The feeling on the top was amazing. 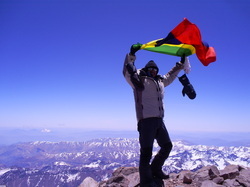 I stood there thinking to myself ‘what a wonderful world this is’ and that I was so lucky to be at the top of Africa. It helped me appreciate the planet we live on and how grateful we should be to be here. I met some of the most interesting people on Kili. The local guides and porters were extremely polite and professional. And they were all very fit having to climb up and down the mountain and made the fittest of us look very unfit. I was told that one (of ours) had a heart rate of 50 beats per minute even whilst speeding uphill with a sack of potatoes slung around his shoulders!